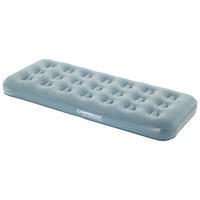 Relax in ultimate comfort and luxury with the Coleman Maxi Comfort Air Bed. 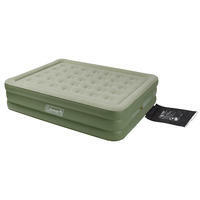 Great for camping or as a guest bed in your own home! Advanced Double Lock? Valve System - Two valve sealing points guarantee a leak-free product. Makes inflation and deflation fast and simple. The raised option offers comfortable integrated coil structure and raised perimeter ensure support and comfort while sleeping. Wrap 'N' Roll? 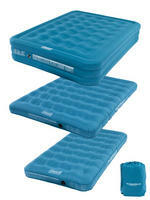 System - A convenient airbed storage solution: Fold | Roll | Store. The generous dimensions and supportive coil structure of Maxi Comfort Bed Raised King offers a comfortable night’s sleep. Airbed combines extra comfort with leak-free reliability thanks to the Coleman® Airtight system, with a Double Lock™ valve – which means you can rest easy. The Maxi Comfort Bed Raised King combines luxury and reliability thanks to the Coleman® advanced Airtight® system featuring a Double Lock™ to guarantee a leak-free airbed.